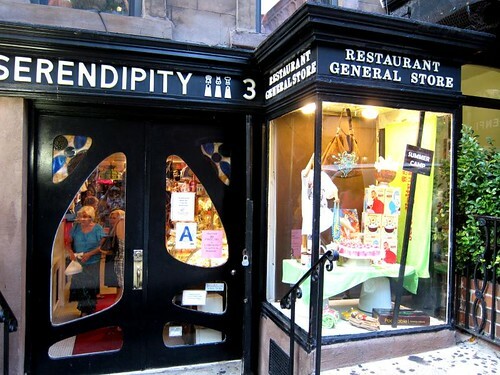 Kat wanted to revisit Serendipity 3 which she went at her last trip to New York City. If you are unfamiliar with Serendipity 3, this cute little bistro got famous because of this movie. 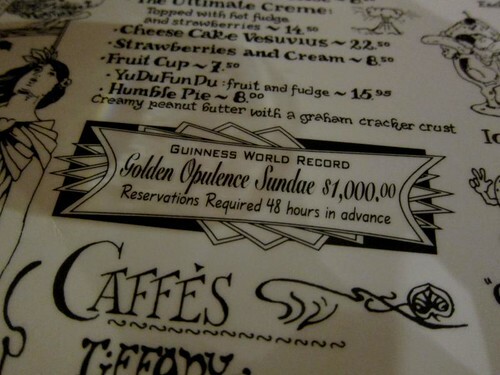 When we reached Serendipity, there was a queue and we needed to wait for at least an hour. 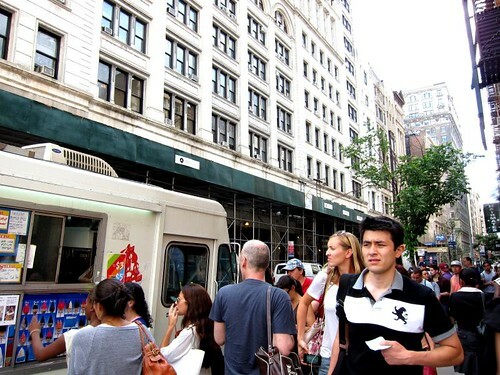 So we went around the vicinity and spotted Dylan’s Candy Bar – founded by the daughter of Ralph Lauren, Dylan Lauren. Before we went into the store, I was like “Okay, let’s take a look. I doubt I will buy anything’. All I can say was I had to take my words back. 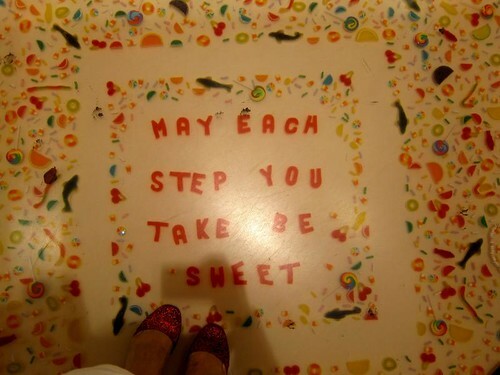 The moment you stepped in, it was like modernised Willy Wonka and the Chocolate Factory – whatever sweets you want, they have it. 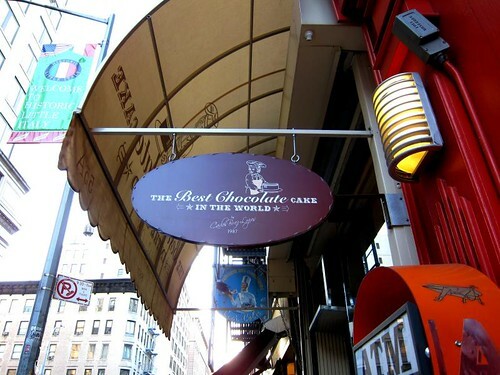 Dylan stocked candy, chocolate and even related merchandises (Kat bought a pair M&Ms earrings). 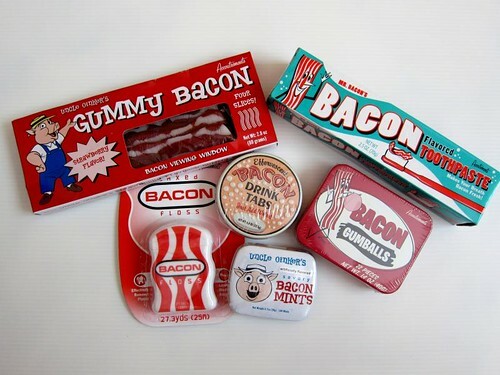 I chanced upon a bunch of bacon flavoured lollies and I knew I have to get them for my bacon loving friend – The Food Pornographer. While I was paying for them, the cashier went “Someone sure loves bacon”. After Dylan, we went back to Serendipity and got our seats. 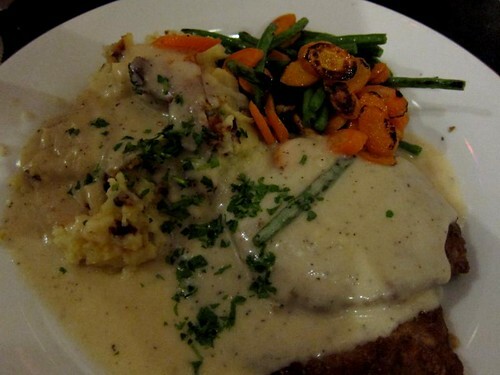 I went for the dinner special – country fried steak while Kat ordered the spiced chicken flambé. 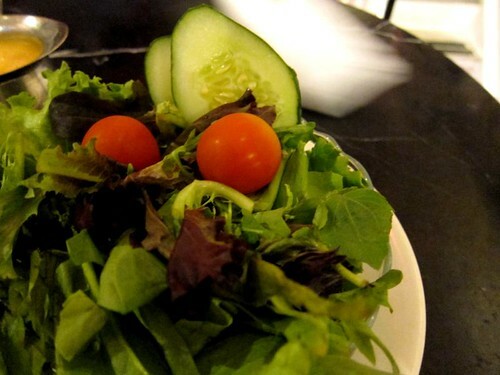 All the mains came with a garden salad – we only took one serving as “someone” don’t eat vegetables. Sad to inform the garden salad is just a salad. Nothing magical. Kat was rather happy with the spiced chicken flambé which was drowned in this creamy winey (brandy Madeira to be specific)sauce. I had a taste – the chicken was cooked well as for the sauce, I don’t fancy it. The alcohol taste (and smell) was just overwhelming. For my country fried steak, it was alright. Though the steak was overcooked, I like the gravy very much. 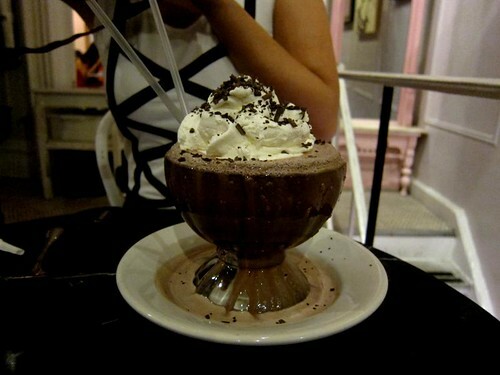 When one is at Serendipity, it will be very wrong to leave without drying their famous Frrrozen Hot Chocolate. Topped with (a lot of) whipped cream, this frozen dessert was a killer – it was rich and chocolatey. 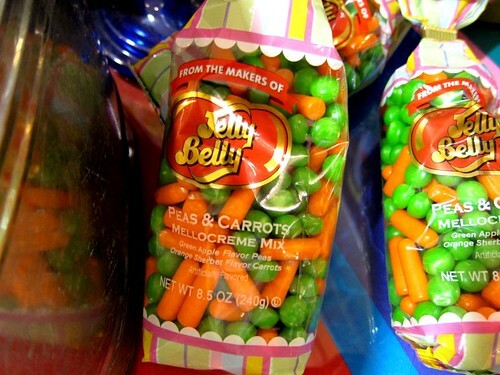 It was not disgustingly sweet so you just kept wanting more. I was surprised the girl at the next table managed to finish it by herself. I was suffering from brain freeze! I am not very keen on the mains at Serendipity but I definitely come back for their desserts. Frrrozen! No, I did not have the hottest curry in the world. 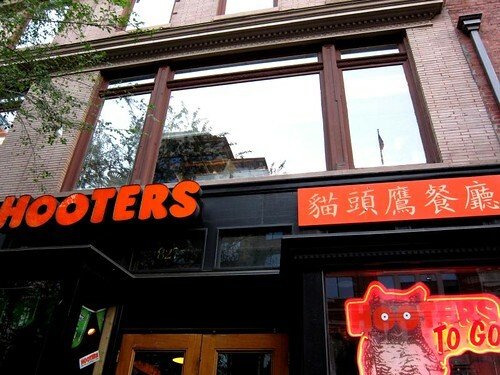 Just went in and had the US$9.95 lunch buffet. A decent spread – I think I went for two rounds of food. As usual, Indian sweets were inedible – my teeth hurt when they bit into them. Still I LOVE sloppy food. After our dinner at Torrisi, Kat and I were not satisfied in the dessert department. During our walk around the neighbourhood, we spotted this quaint little cafe – The Best Chocolate Cake in the World – we decided to go in and take a look. The Best Chocolate Cake in the World has all things chocolate – from their famed chocolate cake to chocolate shots made with Valrhona chocolate. We couldn’t decide between the traditional and the bittersweet. So we went for the tasting menu. 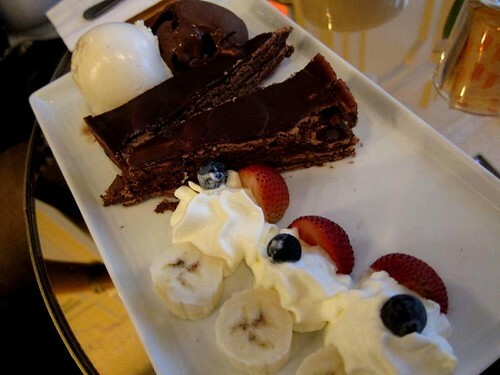 For a measly US$9.85, we got half a slice of the traditional chocolate cake, half a slice of the bittersweet chocolate cake, two scoops of gelato, fruits and whipped cream – I think it is safe to declare it was the best value for money tasting menu. I had a quick bite of both the traditional and bittersweet chocolate cake and declared that I like the bittersweet version better. And guess what? Kat liked the traditional chocolate cake! 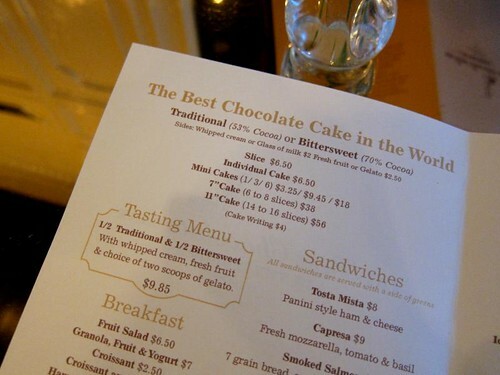 Now here’s the catch – the best chocolate cake in the world – is not a chocolate cake. If you go into the shop, expecting some fluffy chocolate sponge cake with rich buttercream, you will be disappointed. 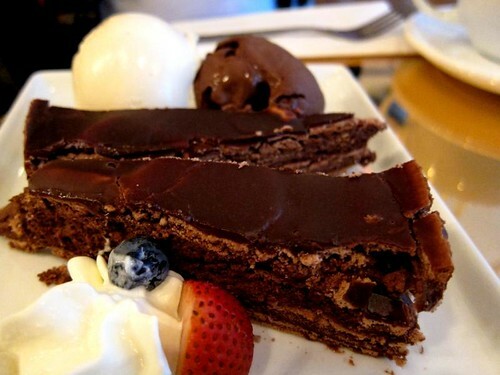 The best chocolate cake in the world is made up of layers of crispy chocolate meringue and chocolate mousse which is topped with a layer of chocolate ganache. It’s a lot of chocolate! I was glad we went for the tasting menu. Though the cake has layers of chocolate mousse, the crunch from the meringue got a bit monotonous. The gelato (from Il Laboratorio del Gelato) helped to provide texture, and glided the cake down the throat. 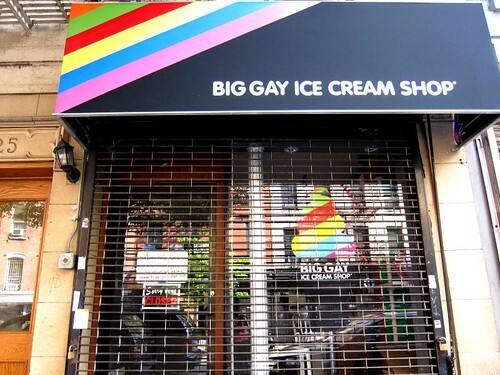 By the way, the gelatos were fabulous. They were creamy and delicious – they were good on their own or with the cake. While we were having our cakes, we observed that a lot of people walked into the shop, asking the girl at the counter “Is this the best chocolate cake in the world?”. Before I left, I asked the girl at the shop how many times she got ask that question. She rolled her eyes and said “Countless”. So if you ever pass by the shop, just go in, order your cake and eat it. Spare the poor girl with the question. Touted as one of the most wanted tables in NYC, Torrisi Italian Specialties operates as a sandwich shop by day and just last year, they decided to open for dinner. Kat and I rushed down to Torrisi after our ice cream. Phew we made it in time and managed to get the 6pm reservation. After a walk around the neighbourhood, we returned to the restaurant and were promptly seated. 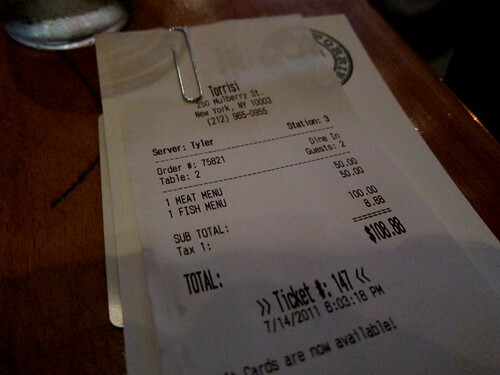 Torrisi is small – there are only 18 seats. Everyone was seated at the same time, and all of us were to get the same four-course meal (antipasti, pasta, main and pastry) which changes daily and no menu substitution allowed. The service staff at Torrisi were warm and friendly. They took our bags so that we have more seating room. One of them noticed we have cameras and promptly told us that photography was allowed (just no flash). 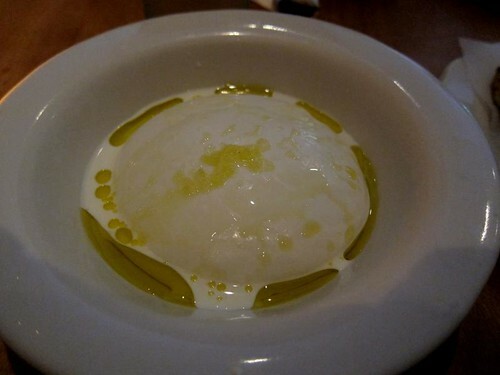 Once we were settled down, our first antipasti dish was served to us – warm mozzarella with Da Vero olive oil, milk thistle cream and a sprinkle of sea salt. This dish was DIVINE! And it was also the best dish we had for the night. The warm mozzarella which was made to order was fresh, chewy and ridiculously milky. The olive oil and the cream just worked so well with the cheese. The sprinkle of sea salt gave a bit of texture and enhanced the flavour of the mozzarella. 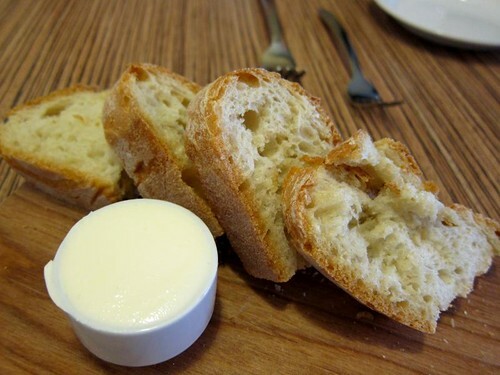 While Kat and I were indulging in the warm mozzarella, a complimentary plate of garlic bread was given to us. 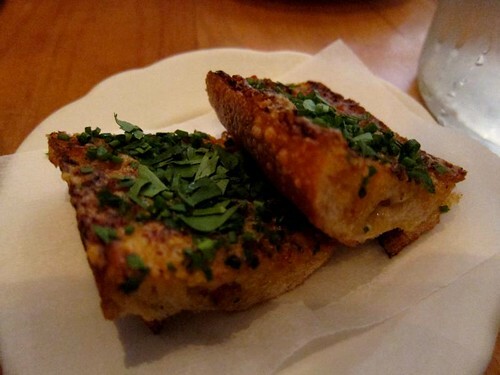 The garlic bread was delicious – it was rich, crispy, and buttery. 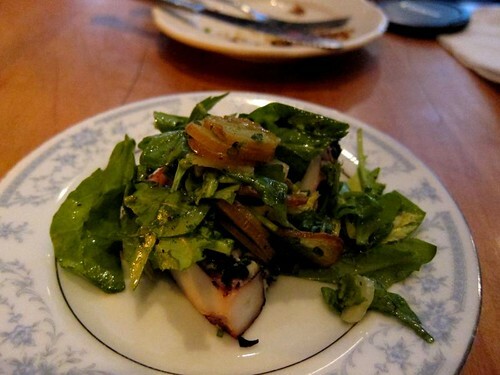 The next antipasti dish was the octopus salad. Can I say Rich Torrisi and Mario Carbone (chef-owners of Torrisi) know how to prepare seafood? The octopus was cooked to perfection – it was not rubbery – just a few bites, and everything just melted away. Next was the New Yorkese cucumbers. I was given the honourable task to finish this plate (Kat don’t eat vegetables. YAH). 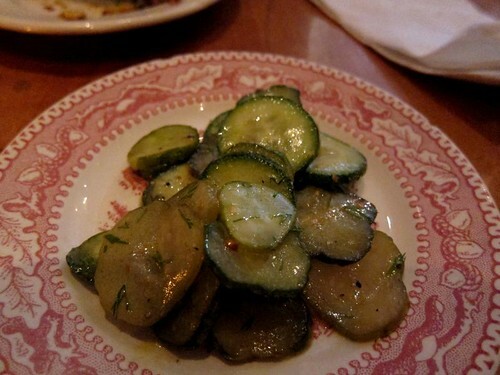 This dish was more like an assortment of pickles. Explained by our server, the cucumbers were aged differently – some were a few days old, while others were aged for a couple of months. I like some of them while some tasted like dill pickles which I don’t like. 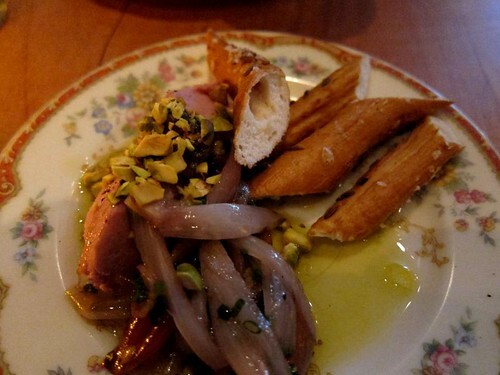 Our last antipasti dish was liverwurst and pretzel. Though I don’t fancy liver, I decided to give it a try. Indeed, I still don’t like liver. The liverwurst was creamy and rich but it has a porky aftertaste which I hate. That said, love the pretzel! For our pasta course, we got spaghetti di mare. I kid you not with my earlier comment on the brilliantness of the chefs when it came to cooking of seafood. 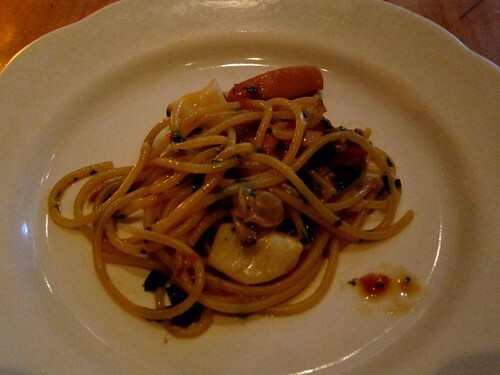 Every piece of scallop, clam, prawn in my spaghetti di mare was well cooked – buttery and soft. When it came to our mains, our server told us we have a choice of a fish or meat course. Since I am not a fan of lamb, I went with the black bass. 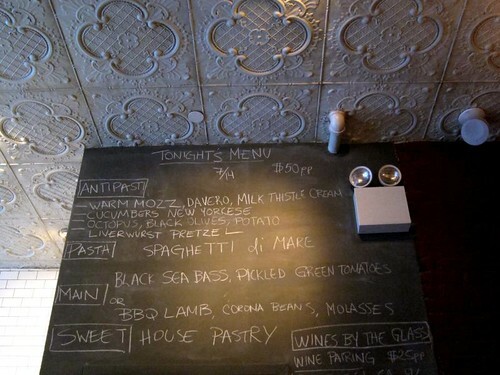 The black bass was not overcooked – it was flaky and delicious. 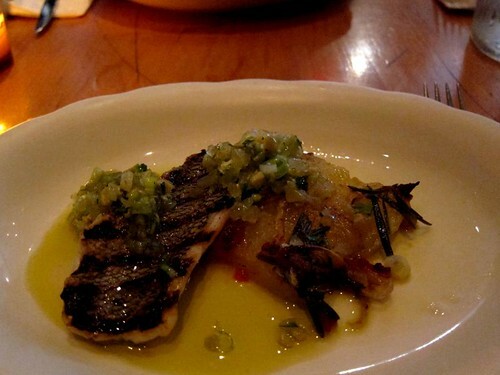 The pairing of the black bass with pickled tomatoes was great – it made one salivate and wanting more. I had a bite of Kat’s BBQ lamb with molasses vinaigrette. 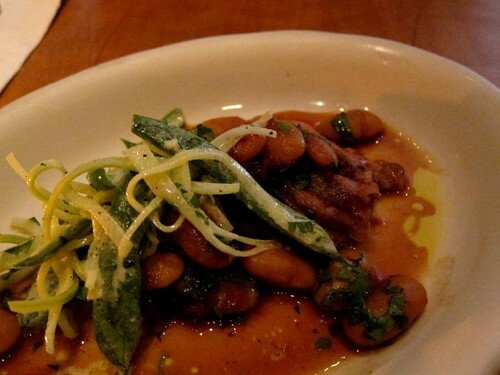 Though I like the vinaigrette, I really don’t like the taste of lamb – too gamey. 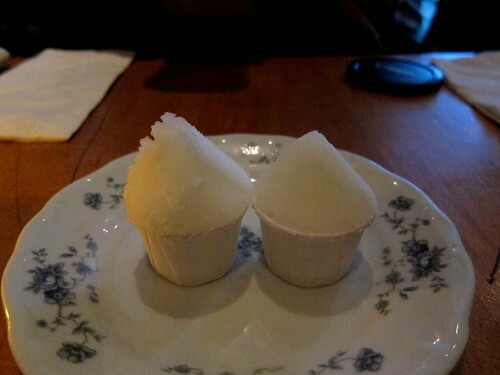 Before the pastry was served to us, we were each given a tiny cup of Italian ice. The flavour of the day was lemon. I am a big fan of citrus – but the lemon ice was way too sour – I only managed to finish half of it. Still a good palette cleanser. Finally. 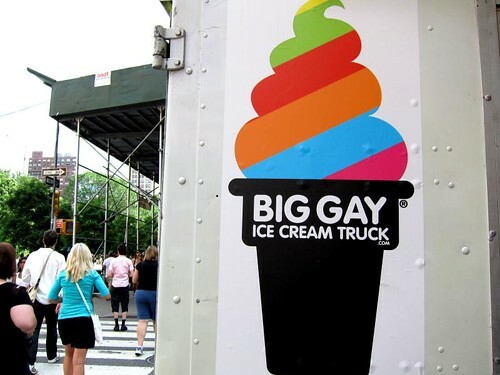 Dessert. 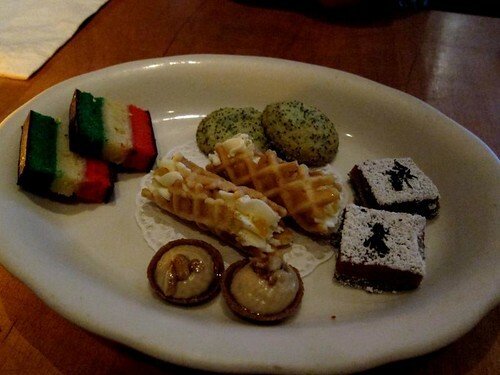 We were given a plate of pastry which consisted of celery sugar cookies, cannoli with Salvatore filling, rainbow cookies, rhubarb bar and sunchoke tart. My favourite was of course the cannoli – the “shell” was crispy and the filling was creamy and rich. I also quite like the rhubarb bar which was earthy and tart. As for the rest, they were alright – didn’t rock our world. 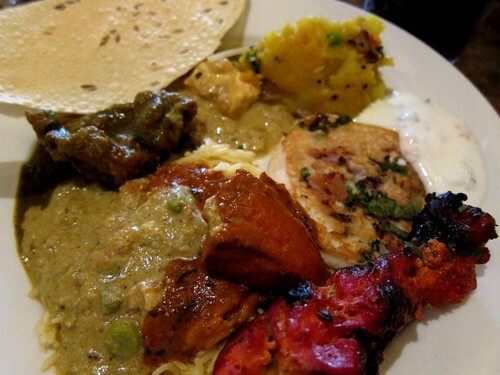 Though this was a four-course meal, it turned out to be a nine dishes affair. The portion for each course was just right. It was the first time we were not struggling to finish the food. For the price of US$50, this prix fixe dinner was value for money – everything that was served to me was fresh, well cooked and delicious. 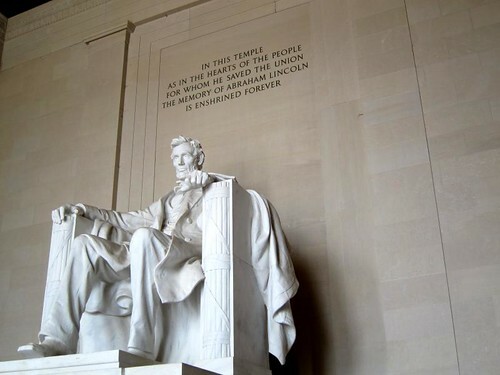 If you are not a fan of museums or memorial sites or monuments, I think I can safely say DC is not for you. Everywhere you go there is going to be a museum or some historical site. Even at the suburb where we stayed. 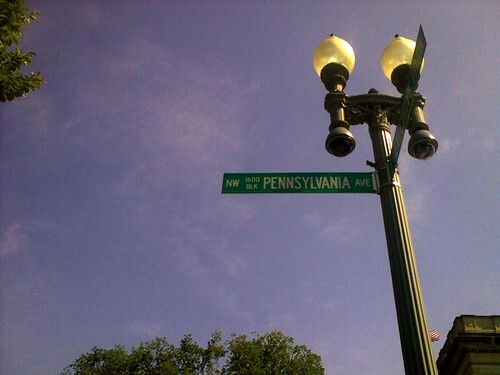 It was our first trip to DC and we totally did not expect it to be that hot. Yes even though I am from the tropics, the heat was a killer. It killed our appetite for food and drained all our energy. As we were only spending four days in DC, we did not do any intensive research nor did we travel out of DC. However we knew what we want to see. To me, being in DC means going to the White House. Initially I thought we can book the tour while we were in DC. WRONG. Thank god I decided to check and realise that for foreigners who would like to visit the White House, they will need to apply via their embassy in DC. I did this in advance – a couple of months to be exact. After exchanging emails with the embassy and filling in forms, we finally got the date. Another tour I booked was the US Capitol tour. For that, it was much easier. You can apply the tour online – I did this two weeks in advance. I was very impressed by the folks in DC. While going for the White House tour, they had screwed up by date of birth and I had to wait under the (hot) sun while they check with the embassy. The guard at the White House was really nice and explained to me on the long wait and so on. So don’t be afraid, feel free to ask anyone for help or direction. 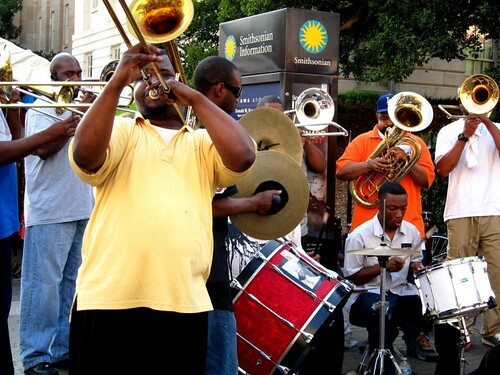 Unless you are staying in DC for a week, it is nearly impossible to cover all the Smithsonian museums. 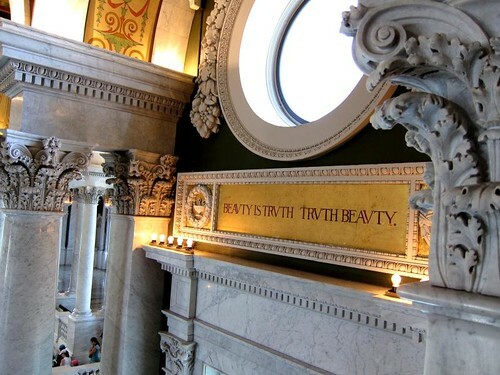 What’s so great about the museums? Firstly, they are FREE. Yes, FREE. And just because they are free, it does not mean they have crappy exhibits. The exhibits in the museums that I visited are inspiring, interesting and truly impressive. 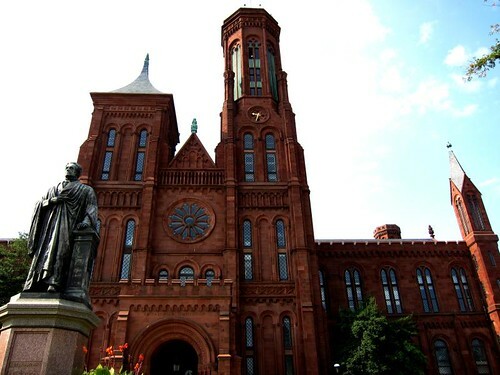 My personal favourites were the Smithsonian’s National Museum of American History and the American Art Museum. The couple of places we went (not all were featured here), the food was extremely salty and the dessert was very sweet. 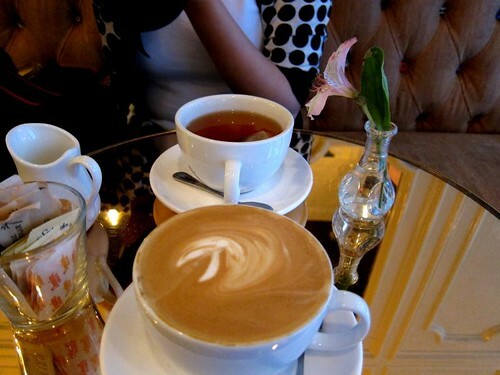 My tongue is quite sensitive (I am one of those snobs who can taste the “tea bag” in a cup of tea) and my palate is rather bland. Hence I was not used to the extreme use of salt and sugar. 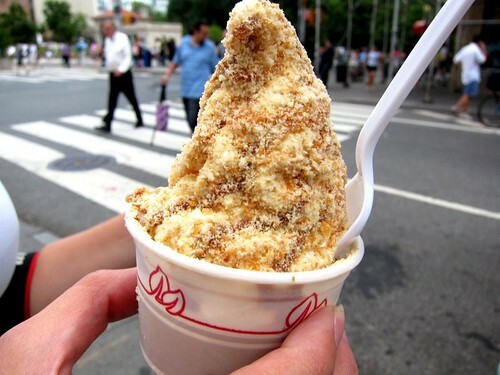 That said, it does not mean DC lack of delicious food. I just needed to research more. I only managed to do the latter. 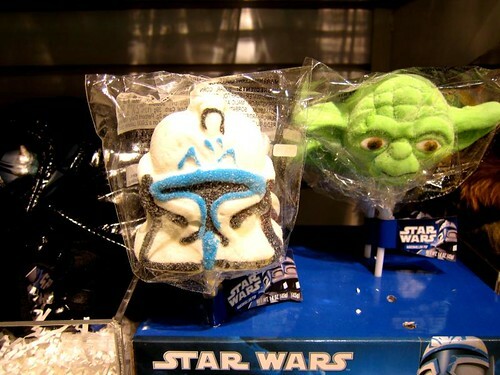 And I totally regretted not watching the movies before the trip. I am not a Nicholas Cage’s fan but both the movies were just pure “DC”. While watching the movie, I was like “oh I been there, and there”. I know it’s annoying but I just can’t help it! Throughout the DC trip, I really felt like a tourist. I have never been on so many tours – yet I was loving every moment of it. On our last day, it was raining, we decided to take the open top sightseeing bus. It was interesting and relaxing. When we were at Library of Congress, we gate-crashed a tour too. It was all good fun. We booked our accommodation via Air B&B. Kat and I were very lucky to have met Neil and Jessica (and their dog, Charlie). 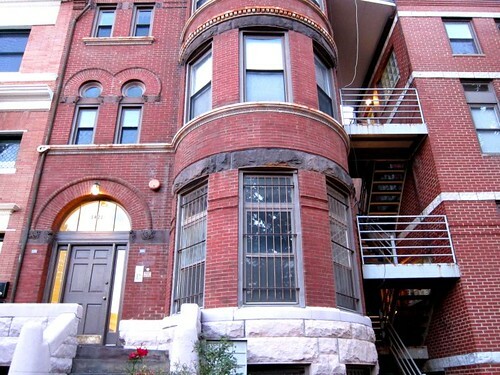 They were so thoughtful – they prepared towels, toiletries, and even Metro cards for us. Everything was so well organised. They were so nice, they even got us breakfast! When we didn’t touch any of it, Jessica wrote us a note and told us they got food for us. Neil and Jessica rock! On the last day in DC, Kat and I decided to keep things simple and have dinner near our place (and we need not rush back to pack). 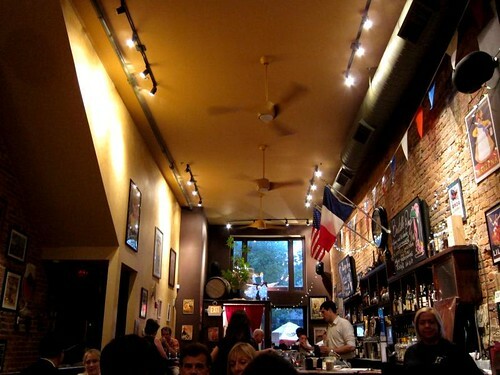 After walking around U Street, we settled on this small French bistro – Bistro La Bonne. As it was rather chilly (yah, the weather decided to turn nice and cooling on our last day in DC! 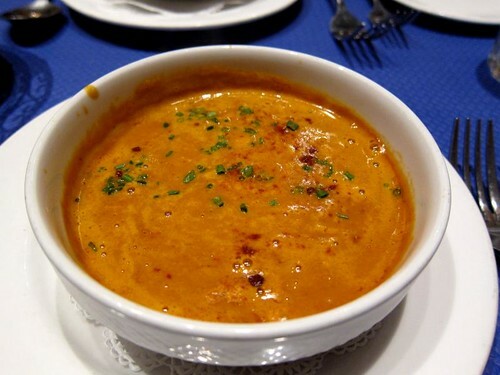 ), we started our meal with a bowl of lobster bisque and crab meat. The soup turned out to be more tomato-ish rather than a rich seafood flavour broth that a good lobster bisque should be. My main for the night was steak frites. The steak was cooked to my preference – medium rare. 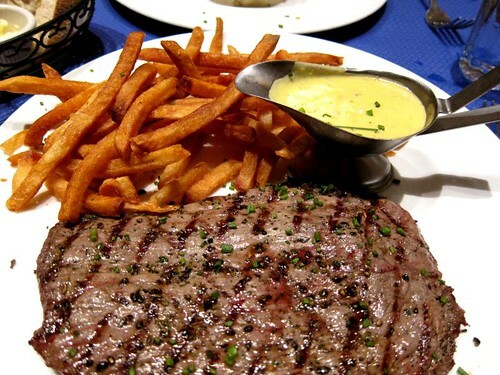 The accompanying béarnaise sauce was flat, and didn’t help to enhance the flavour of the steak. As for the frites, they were over-fried and dried. 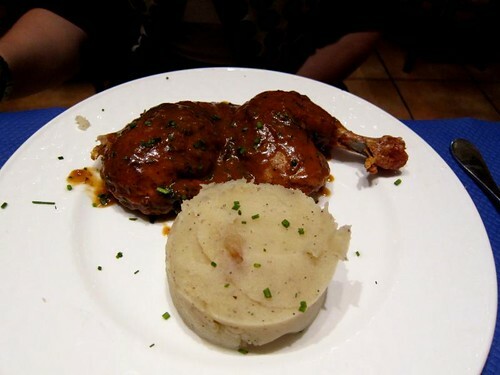 Kat got the poulet roti – roasted chicken with mashed potatoes. I didn’t taste the chicken but she did tell me the dish was rather salty. 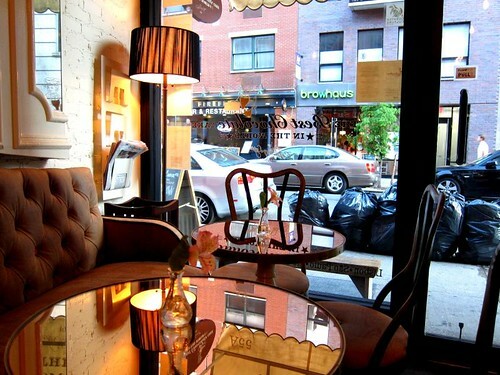 Bistro La Bonne was not exactly the best place to end our DC journey – still I really like bistro’s cosy ambience. en route to the lincoln memorial, we dropped by art and soul, a modern southern restaurant owned by the fame chef art smith (aka oprah winfrey personal chef). the heat in DC kinda killed our appetite so we only ordered one appetizer, one main and a side to share. everything came to the table at the same time. 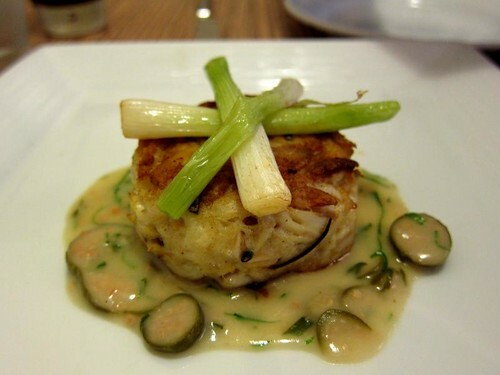 for starter, we got a pan fried chesapeake blue crab cake with sauce ravigote. 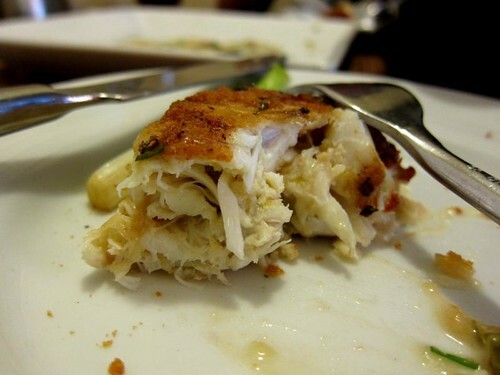 the crab cake was chokeful of crab meat – there was no flour or bread crumb stuffed inside – just pure crabby goodness. 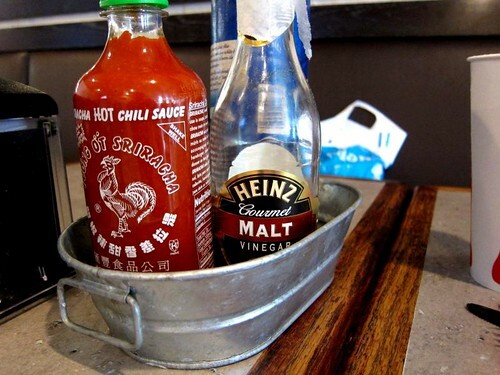 the sauce was rich and delicious, and it went very well with the delicate crabmeat. our main was free range fried chicken. 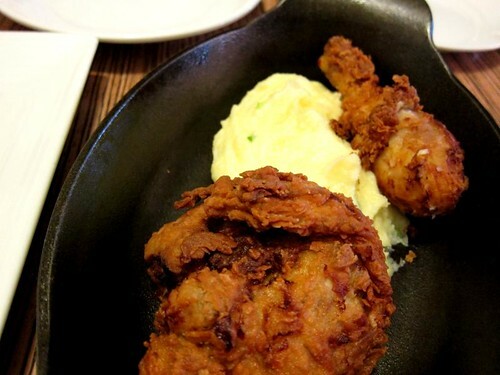 the chicken was buttermilk brined, seasoned and fried; the dish was served with a side of mashed potatoes. the chicken was tender and juicy (the magic of buttermilk) however i wished the crust was a bit more crispy. the mashed potatoes. sigh. over-salted. 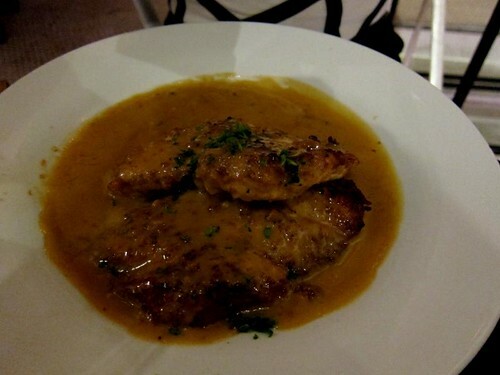 we didnt really touch the black pepper gravy that came with the dish – it was alright, didnt blow our mind. 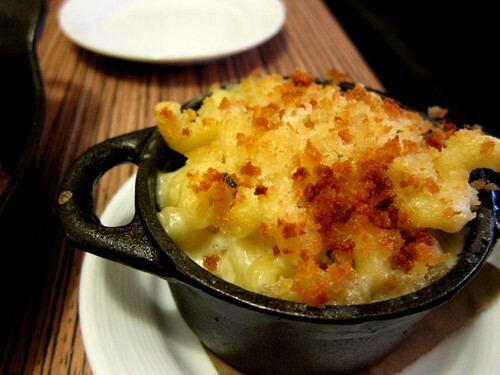 the last and the best dish of the day was the macaroni casserole – aka mac and cheese. the casserole was topped with bread crumbs that got crisped by the oven, and underneath the crust was rich and cheesy macaroni. we were trying our best not to lick the pot. 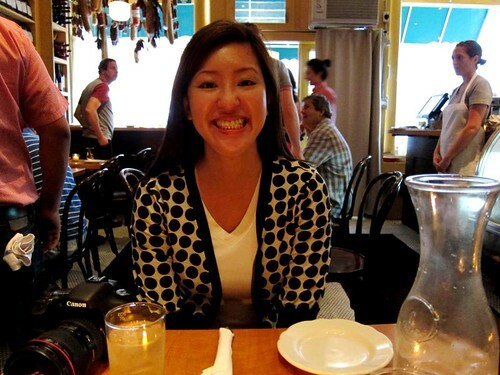 even though art and soul has hits and misses, it was definitely one of my favorite restaurants that i visited in DC. 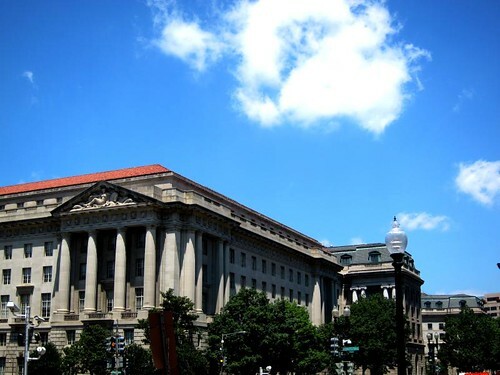 oink’s guide to … Washington DC! What’s cooking, Uncle Sam? 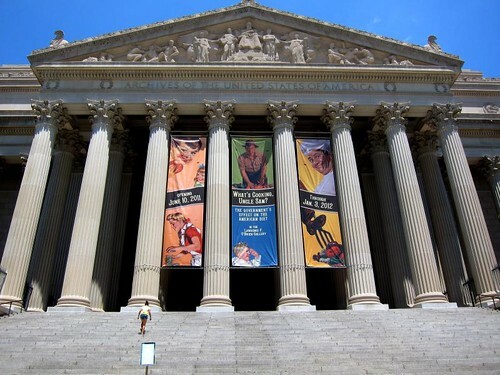 if you happened to be in DC from now till 3 jan 2012, one of the exhibitions that not to be missed is the “what’s cooking, uncle sam?” at the national archives. the exhibition illustrated the history of American’s food records over the past two centuries. while going through all these food records which comprised of posters, videos, books, the American government tried to inculcate good eating habits, preserving food resources (canning, gardening). as the years go by, these efforts and campaigns just went down the drain (which was very sad). and one thing i really love about the exhibition was the illustration, the campaigns – the messaging, ohhh those vintage posters (yes i bought one from the gift store). “what’s cooking, uncle sam?” was educational, and really made you realised the importance of food and eating good food. 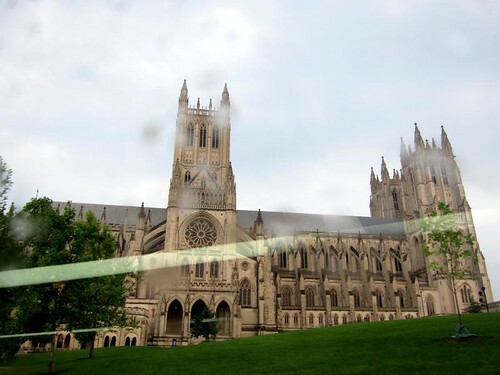 on the last day in DC, kat and i decided to take the sightseeing bus. at the end of the ride, we were dropped off at chinatown. just 15 minutes there, it left us in stitches. 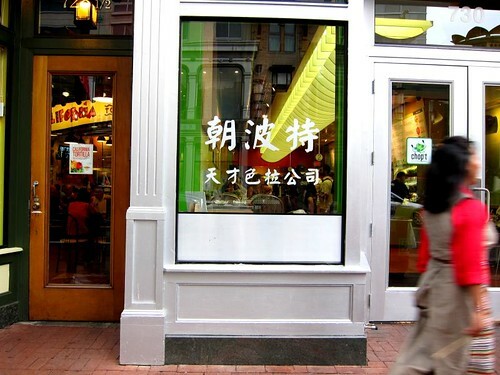 every signage in chinatown will have the corresponding Chinese words. 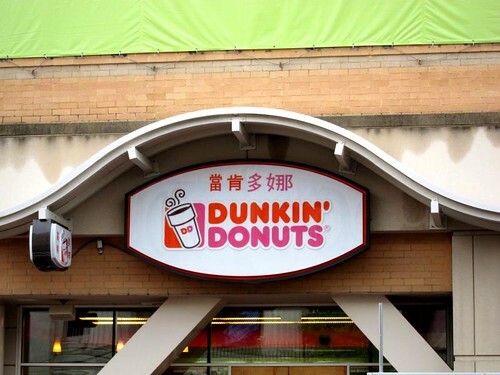 the problem with that was 90% of the signages were all literal translation of the English name. 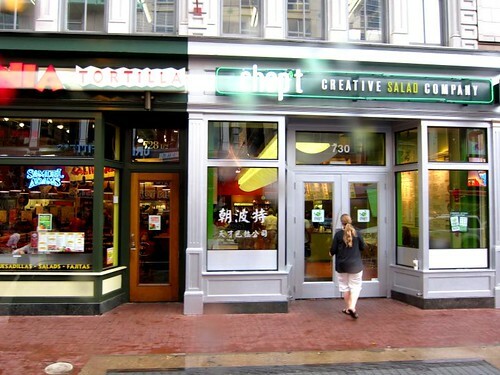 guess what is the chinese name for creative salad company? the translation was so bad that we could not stop laughing and i think everyone on the street must have thought that we have gone mad!